How does Geothermal Energy Work? The fundamentals of a geoexchange system are simple. 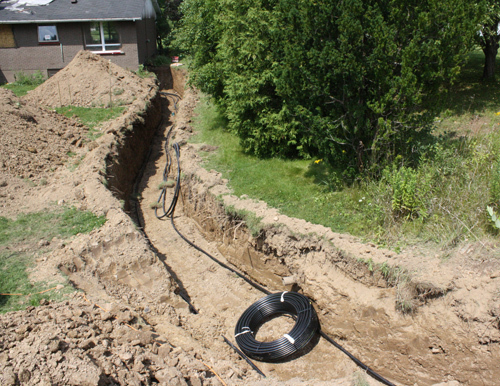 An underground system of plastic pipes form a ground loop that exchanges thermal energy with the earth to heat your home during the colder months and cool your home during the summer months. To heat a home, the earth is used as the energy source to provide thermal energy and to cool the home, the same underground system uses the earth as a heat sink (depository) to remove excess heat from the indoor environment of the house. The temperature of the earth starting at a depth of only a few feet below the surface remains relatively constant throughout the year, even in the middle of winter with a thick covering of snow on the ground. Specially designed high-density polyethylene pipes are buried in the ground and filled with an ethanol antifreeze solution to create an efficient heat exchange fluid, which is circulated through the pipes and delivered back to the heat pump. The heat pump is typically installed in the basement where the furnace would traditionally be located. In larger homes we often install two or more heat pumps and some may be located in a utility closet or conditioned attic space, so designed to serve the upper part of the house better. The collected energy is then concentrated into a useable form by the heat pump working through a refrigeration cycle. A forced air ventilation system then distributes the warm or cool air to the various rooms in your home.